It’s been 6 whole months since my last drink, and 6 whole months since I was transported to the hospital almost dead (again). Six whole months since I saw no light in this world. Six whole months since I thought my family and friends would have been better off without me and the demons that consumed my every waking and sleeping moment. It’s been 6 whole months…that I have been healing. 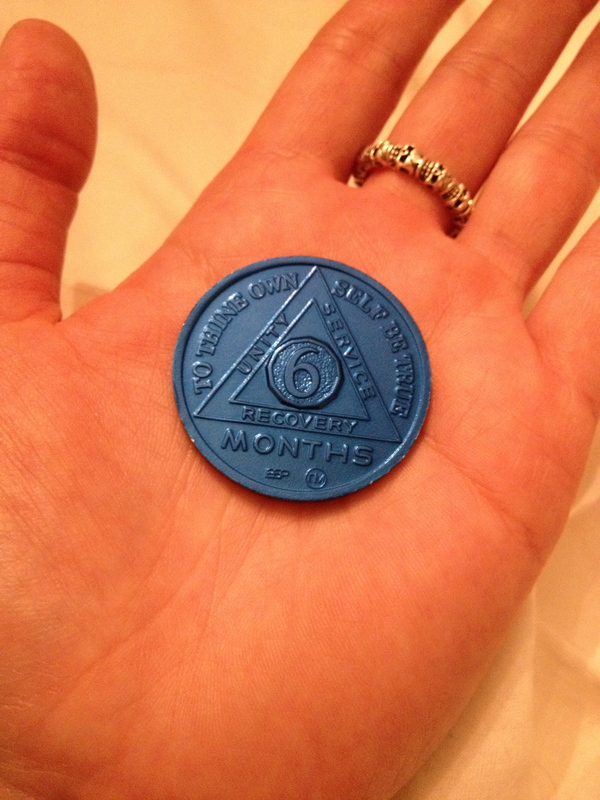 Six months may seem like such a short period of time to you, but for me and my sobriety and health it feels like an amazing life-time. I’m going to try to put into words how life feels to me now. But bear with me because these feelings are so new, that articulating them isn’t going to be super easy. I think explaining them through life moments may help me a bit…so I will. Going to Homewood was a blessing beyond my wildest imagination. Not only because it helped me so much with my PTSD, but because it exposed my alcoholism. Through my 12-step fellowship I have grown into a happy and healthier mom, woman, sister, daughter and member of society. After balking at a program that I thought couldn’t possibly be for me, I finally surrendered, and have grown to heal not only my alcohol addiction, but I’ve also made leaps and bounds of improvement in my mental health. Life…IS…GOOD!..Words which are becoming less foreign to me now. But this good life still takes hard work to maintain. I pray and meditate every day that I do not take advantage of any blessing a new day brings. And I shake my head in awe as I type this, because 6 months ago I only prayed for God to take me away. I was then suddenly mindful of the calmness I possessed for the trip. I was aware of the absence of any craving to hurry up and find a restaurant with wine, or to hurry up and get home so that I could drink my anxiety away for the night. I was simply at peace! The old Natalie would have been cursing the construction and how sore my tailbone was from sitting so long. The old Natalie would have been so irritable and would have taken away all of the excitement Caroline should have for the day. But the miracle didn’t stop there… Caroline then told me how she doesn’t wake up and walk on eggshells until she can decipher my mood anymore. She told me I was just happy now, and patient. What a true moment of bliss. Hearing those words from my daughter’s mouth literally made my heart pour out joy! We were enjoying a day I never could have enjoyed before, and words simply cannot express the gratitude I felt at that very moment, and now. Oddly enough, not all of the miracles I’ve been experiencing involve smiles and happiness (which you would think all miracles would)…I’ve now been experiencing what I call ‘grateful sadness’. Sounds crazy I know…but let me explain. Save My Life School, Grad School, the Buddhist Centre and Homewood have taught me SO MUCH about how to not be afraid of my emotions and how to allow myself to feel them, let them move through me, and then leave. It’s becoming second nature to me now as I practice mindfulness of my emotions all day, every day. But experiencing ‘grateful sadness’ yesterday was one of the most enlightening emotional moments yet. I’m working on step 4 of my 12 steps which involves a ‘searching and fearless moral inventory of ourselves’. And as I moved through my moral inventory and analyzed my resentments, old and new, as well as my shortcomings and selfishness, flashes of the ‘old days’ flipped my stomach over, and made me very, very sad. I was warned by my sponsor that this type of emotional response would quite possibly happen, so I allowed myself to feel all the emotions the inventory brought forth. And when I got to reviewing recent relationship losses I’ve experienced, I cried, and cried and cried. I sobbed, loud, gut-renching cries which made me feel out-of-control and uncomfortable…feelings I would have most definitely numbed in the past. But I didn’t numb, I didn’t even think of it, I simply felt, and when I was finished crying (half a roll of toilet paper later) I realized I then felt…fine. I didn’t feel depressed or anxious. In fact, the only thing that reminded me of my depression was that I was in my bedroom. Then another huge epiphany occurred to me…It’s so hard to explain in words, but I discovered that this sadness was a safe sadness. It was what healthy people felt! It was normal and didn’t hurt me…it was actually helping me! After my cry I got in the shower and got ready for my 12 step meeting. NOTHING in me wanted to stay in my room and wallow in self-pity. NOTHING in me wanted to dissociate and hide for the rest of the night. I was ok!…and I loved it! And if learning what ‘grateful sadness’ is, isn’t enough of a blessing, while I was crying another miracle occurred! Caroline heard my sobs (as most of the city probably did) so she came in to hug me along with my friend Lana. But after she had given me a good solid hug, she left the room and went about her day. When I told her I was just ‘normal sad’ and not depressed, she believed me right away. She trusted me! She didn’t need to worry this time that she would find me unconscious on the floor in an hour. She was just a healthy girl, seeing her healthy mom have a good cry. Pretty amazing if you ask me! Don’t be worried that I’m in over my head with all of this positive change. While I write and reflect about what has changed for the better in my life over the past 6 months, humility still races through my veins. I know that one bad choice could lead me back to the darkness I felt for so many years. I know that my recovery will always be a work in progress. But once in a while it’s nice to share the good experiences I’m having to show you all that there is always hope. My 12 step book tells me that, ” I was in a hopeless state of mind and body”, but I’m happy to say that all of the work I’ve put into my recovery is actually working! Remember when I said that I always wondered how someone I saw walking down the street even on a beautiful day could be happy? Well I don’t think that anymore…now I wonder how could they be sad? This just makes the pictures so much better! I actually have 😀 I knew you would be proud. Be more proud of yourself! Way to go Nat !!!! This actually made my heart sing. Thank you me well done! Thank you! I hope you’re doing great! Not in any way that I can think of. It’s a lot of internal stuff I need to contain and control in a healthy way. Easier said than done lol, but thank you, I appreciate the offer.